Sometimes writing a review feels like The Adventures of Pinocchio. In which we play Pinocchio. Pinocchio. Helping out with our current review. Take, for example, our current review, which has been in progress for a couple of months now. Doesn't matter what it's about. Just take it. 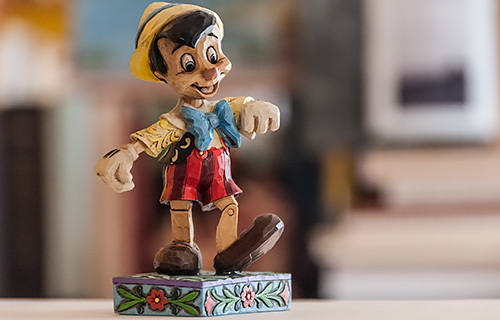 The original Le Avventure di Pinocchio was written by Carlo Collodi (actually Carlo Lorenzini) as a serial for an Italian magazine for children. Each installment featured another misadventure, usually brought on by Pinocchio's misbehavior. Reviewing around here resembles that. Our own misunderstandings and shortcomings tend to led to various misadventures that, it turns out, are rather revealing. If not quite as entertaining as Pinocchio's. So they take months, not days. While you're waiting, we can offer you this consolation. The way you pronounce Pinocchio should help you figure out how to pronounce bruschetta. The "ch" in Italian is hard. If you use a soft pronunciation of the "ch," as in English, the Italian would be spelled bruscetta. No "h."
"H" in Italian is silent, in any case. In fact, a common idiom is to admit not knowing an "H" about something. Which, come to think of it, is generally how we begin each of our reviews: not knowing an "H" about it!